Saving a humpback whale from entanglement is its own reward, but it’s always nice to know you’re appreciated. Once freed by the South African Whale Disentanglement Network in coalition with the National Sea Rescue Institute, according to the AllAfrica Newsdesk, this whale decided to stick around and say thank you. Not being a native speaker of human tongue, he thanked his rescuers in the best way he knew how: by laying his giant head on their boat before swimming away. Imagine him saying in groggy ocean talk: Thanks, guys. I’m not so great at the human words, but hugs are universal. 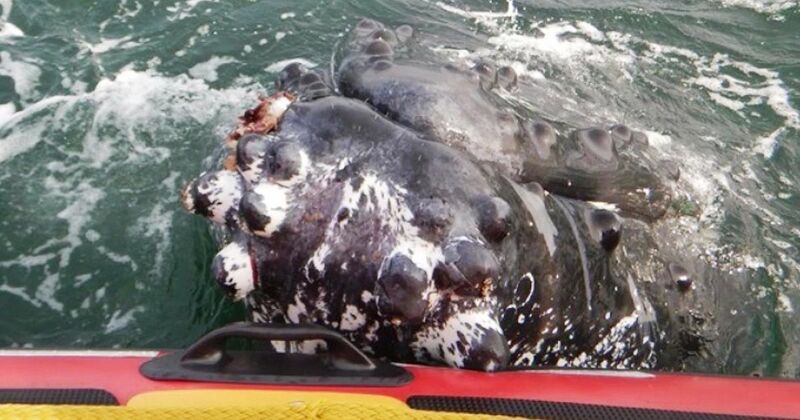 It isn’t really surprising that a humpback would stop to acknowledge its rescuers. The whales have spindle neurons in their brains. These important brain cells are credited for regulating emotion and empathy. Until 2006, scientists thought that only humans and other advanced primates had spindle neurons. They were wrong. Not only do whale have these specialized cells, they have a whole lot of them! Even accounting for differences in brain size, initial studies estimate that a humpback whale has three times more of these cells than a human does. The cells are also twice as long as ours and more prevalent in different areas of the brain. Scientists have found the neurons in only one area of the human brain. In whales, many have been found in the same area as in the human brain, but they’ve also been found in other areas. Based on this information, scientists think that whales may have had spindle neurons powering up in their minds for longer than we have. It’s hard to say exactly how the cells work in such a different animal, but a fair guess is that whales have complex emotional lives. No wonder these massive mammals mourn their dead, save seals from killer whales, and even thank humans after a rescue.